Building a new home from contemporary or modern house plans can be a uniquely exciting experience! Modern home plans, such as the selection available from The House Designers, provide an edgy and exclusive look that will always impress. And as you’ll see, these modern and contemporary blueprints have everything to offer. Read on to see our wide range of homes featuring clean lines, oversized windows, outdoor living spaces, and more! Please feel free to browse our complete collection of Contemporary & Modern House Plans at your leisure. This luxurious contemporary home (House Plan 9044) is incredibly spacious with 3,217 square feet! 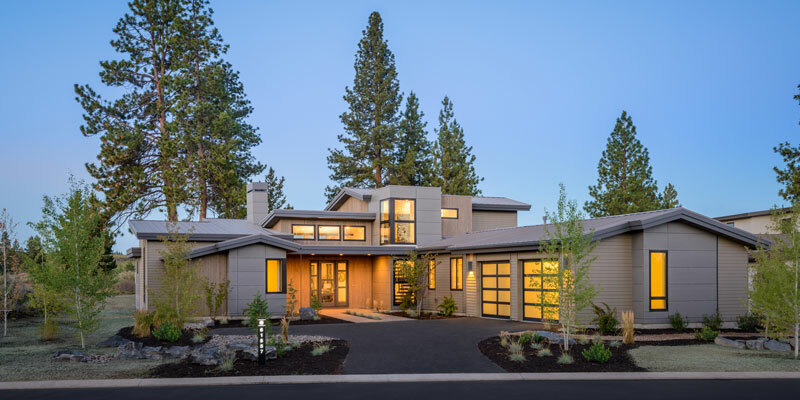 Clean lines and unique windows give this home great curb appeal and an impressive first impression to any guests. The large windows throughout the home also allow you to enjoy the views from any lot you may choose. An open staircase in the main living space gives a dramatic view to the modern and well-lit kitchen. No detail is spared in this, or any, of our modern house plans. The Greenview (House Plan 3075) is a compact, 3-bedroom and 2-bathroom home with a ground-level master and an open-concept first floor. With the additional bedrooms upstairs, the first floor remains open and spacious—great for owners with limited mobility. The second floor loft and deck make great entertaining spaces! With the option to build this design to ENERGY STAR® standards, it allows you to enjoy your home while going green and saving money. This house plan’s small footprint allows it to be built on nearly any lot. And it’s perfect for urban living, too! 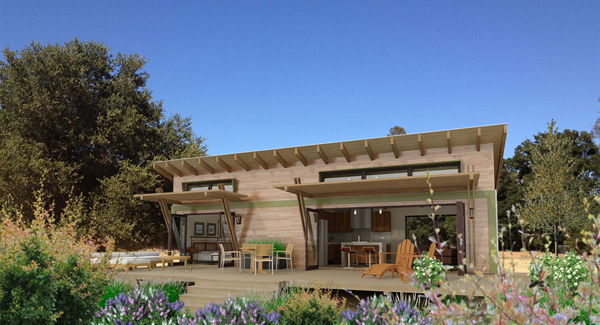 It seems that modern house plans and tiny homes have become the wave of the future! This tiny home, The Snowbird-1 (House Plan 9408), allows you to live life to its fullest. Whether you’re looking to spend more time outside, or build a second home for vacations, this 1-bedroom retreat is an affordable option. By opening the transparent folding doors along the entire main living space, you can move from outside to indoors with ease. This setup also creates the effect of doubling your square footage and makes entertaining a breeze! Looking for affordable modern house plans? The Spark (House Plan 7116) is an amazing option for anyone looking for a mid-sized plan, especially if they are building on a narrow lot. The master bedroom, located on the home’s second floor, has impressive windows, a gorgeous en-suite, and a large walk-in closet! Don’t settle for a home you can’t entertain in just because you have a narrow lot. This home’s patio, porch, and open concept main floor allows for easy entertaining within sleek and beautifully sophisticated architecture. 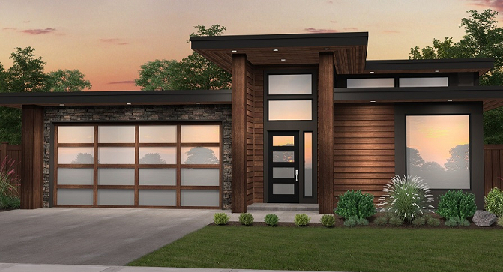 The name Sleek Modern (House Plan 4213) may just describe the perfect mid-sized modern house plan! The front elevation makes quite an impression from the start. 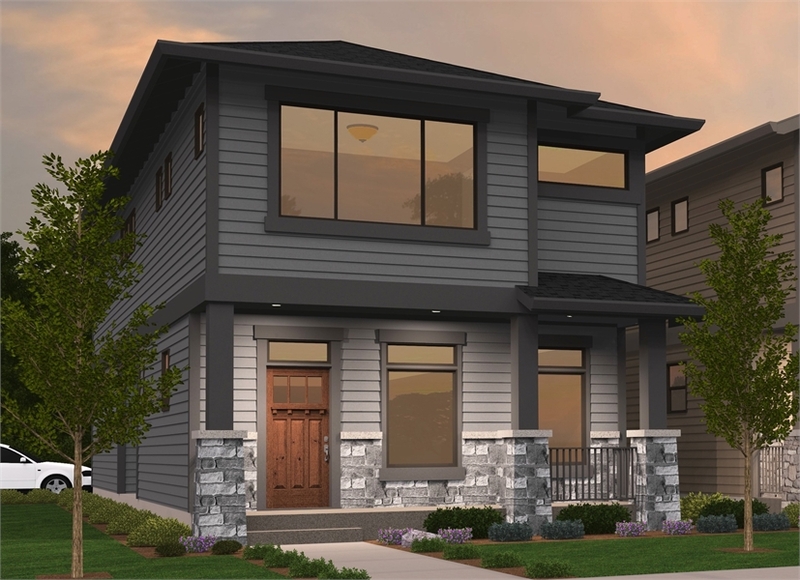 As a single-story house plan, it is designed with 3 bedrooms and 3 bathrooms organized for privacy from the front. The architect designated the front room as a casita, which is often used as a guest bedroom, office, or man-cave. The two-car, front-facing garage and a designated utility room are welcome additions to this home, too. 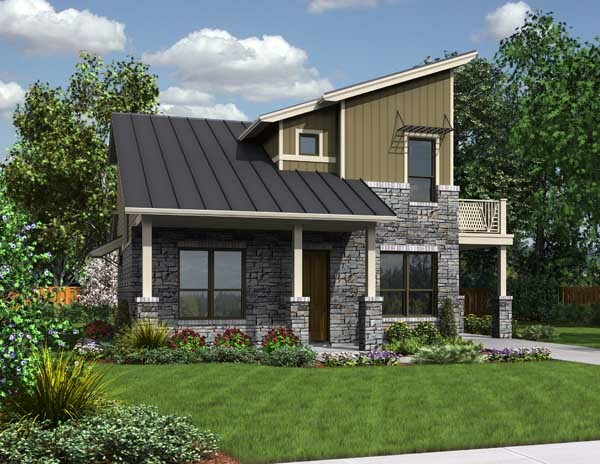 This mid-sized home, The Fredrick (House Plan 9802), is unique and impressive from top to bottom. Satisfy the curb appeal you crave with its amazing front elevation. The two-car garage is topped with a private deck space for the upstairs master bedroom! Also a special treat, you’ll find a stall shower and a large garden tub in both the master and in the hall bath for the other two bedrooms. On the main floor, enjoy a gourmet kitchen open to the dining room. There’s also a powder room attached to the laundry room, and a designated living room for family and friends to gather. 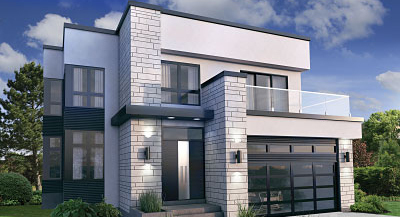 Enjoy browsing our entire Modern Home Plan Collection. While you’re visiting, you may be interested in viewing our Builder Preferred, or Contemporary Home Plan collections as well.